This Article ContentContract Bundeswehr Desert Boots for the Hot and Arid Climate, Sandy-Colored (Wüstenstiefel der Bundeswehr - Kampfstiefel) from "Baltes"
Bundeswehr Boots for Jungle and Desert Regions by "Baltes"
After the unification of Germany (in fact, it was the absorption of the East Germany by the West Germany), crush of the Soviet Union and collapse of the Warsaw Pact, the geopolitical situation in Europe has changed dramatically. The economy and industry of the united Germany has firmly taken the leading position in continental Europe, so the role of armed forces of the new Germany increased respectively. In early 1990s, Bundeswehr soldiers were involved in operations abroad in accordance with the UN or the OSCE mandates only. But later a new idea has become wide-spread: Germany, as an active and powerful NATO and EU member should actively ensure collective security and peace in the world. The events of the Second World War have been gradually forgotten, and after the war in Yugoslavia the Bundeswehr troops have increasingly been used outside the German territory as a peacekeeping force on various theaters of war under the auspices of NATO and the UN. 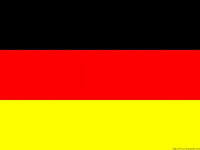 Moreover, the NATO allies have become actively interested in German soldiers participation in all these operations. So, since 1991, the Bundeswehr has been involved in providing combat operation in the Persian Gulf (against Iraq): German soldiers were involved in searching for mass destruction weapons and neutralization of sea and land mines. Later they supported humanitarian activities in Cambodia (1991-1993) and Somalia (1992-1994), then - in Rwanda, Georgia, East Timor, Afghanistan, Uzbekistan, Bosnia and Herzegovina, in the Horn of Africa, Ethiopia / Eritrea, Sudan and Macedonia. One should notice, that Germany has also been taking active part in highly controversial actions aimed at supporting Albanian separatists of Kosovo. Further on Germans participated in NATO operations in Afghanistan and Iraq, the mostly in the countries with hot and arid and wet climates, very distinctive from the European theater of operations. Thus, the urgent need in the appropriate self-developed equipment, footwear and uniforms became the matter of concern for the Bundeswehr. Since Germany has always been a large and self-sufficient military power with long military traditions, the issue of the purchase of clothing, boots and other equipment from any other NATO allies (France, the UK or the USA) was not even raised. It was decades earlier, when the French, the Brits and the Americans had to solve, each one in its own way, these problems in the course of military conflicts in the jungles of Indochina and Latin America, in the deserts of North Africa and the Middle East. The German company "Th. 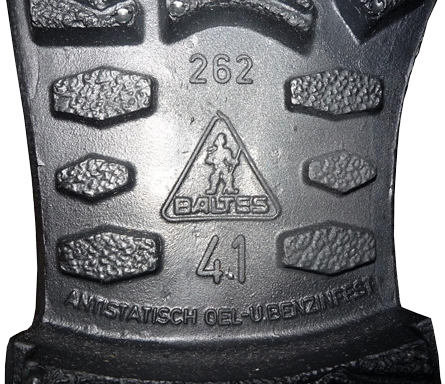 Baltes Schuhfabrik GmbH & Co. KG / Baltes Schuhtechnik und Arbeitsschutzprodukte GmbH" is more commonly known by the acronym - the trademark "BALTES". The company was founded in 1872 and has never changed its owners for five generations. 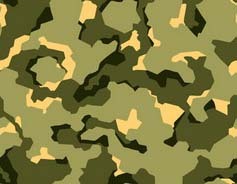 It successfully coped with the task of creating a specialized army footwear hot and arid (desert) and hot and humid tropical climate (the jungle). The company's production facilities are located in a small town of Heinsberg, the Federal land of North Rhine-Westphalia, almost on the Dutch border (to the north of Aachen and to the west of Cologne and Solingen). 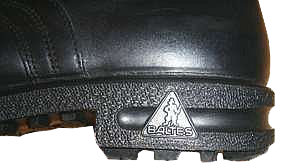 "BALTES" - one of the few modern companies, which in principle refused to transfer their production in the countries of Southeast Asia, making its products in Germany only, from the raw materials of German and European tanneries. This allowed the company to maintain high quality of its products. 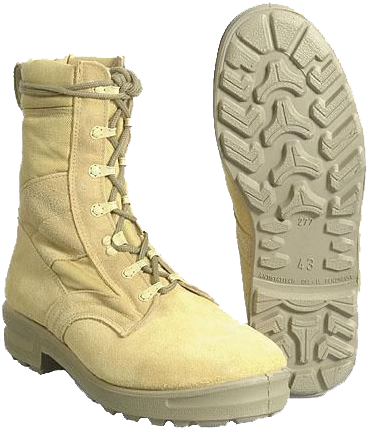 In addition to the army and police footwear, the company also offers a specialized sports, fire, safety, labor, mountain boots, boots and "ankle boots", casual boots and parade boots, being a versatile boots manufacturer. 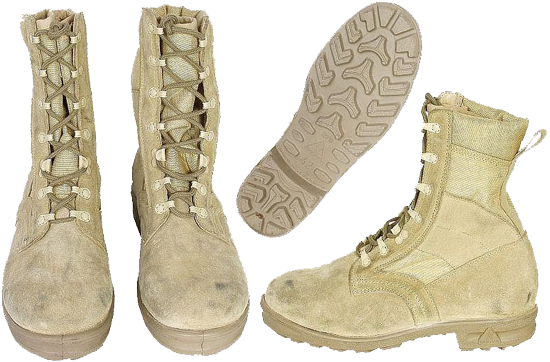 We, the potential buyers of army boots from "BALTES", should take into account, that the footwear from this manufacturer is 2 millimeters longer if to compare with the similarly sized boots from the other manufacturers. For example, if "MEINDL" or "HAIX" boots of sizes 43 and 41 are respectively equal to 275 and 260 mm in "Mondopoint" system, the "BALTES" boots of sizes 43 and 41 will be equal to 277 and 262 mm respectively). This fact, quite possibly related to the special form and structure of the outsole construction. Contract Bundeswehr Desert Boots for the Hot and Arid Climate, Sandy-Colored (Wüstenstiefel der Bundeswehr - Kampfstiefel) from "Baltes"
The outsoles of these boots are made of polyurethane, a composite material, consisting of isocyanate resin and a mixture of high molecular weight spirits. They are of medium hardness, sand-coloured, lightweight, durable and resistant to wear. According to the requirements of the Bundeswehr Regulations for the footwear design and materials, the outsoles are to be anti-static ("Antistatisch"), oil-and petrol (gasoline)-resistant ("Oel-und-Benzinfest"), acid and alkali-resistant and abrasion-resistant.